In July, I travelled with James Leadbitter (aka the vacuum cleaner) and Jakarta-based artist Hana Madness to West Java, Indonesia to visit Istana KSJ. 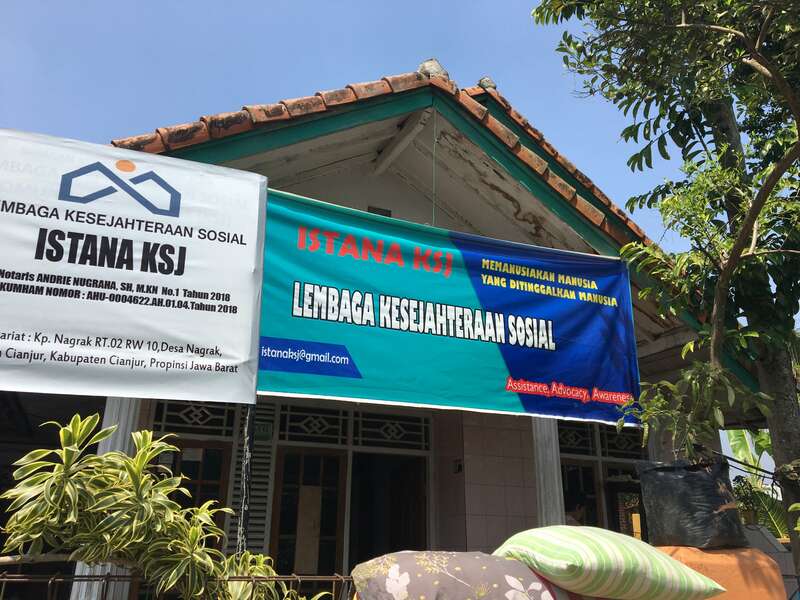 KSJ originally stood for Komunitas Sehat Jiwa (Mental Health Community), but to reduce stigma and maintain safety it now publicly identifies as a Social Welfare Institution. It is most fondly known as Istana (The Palace). 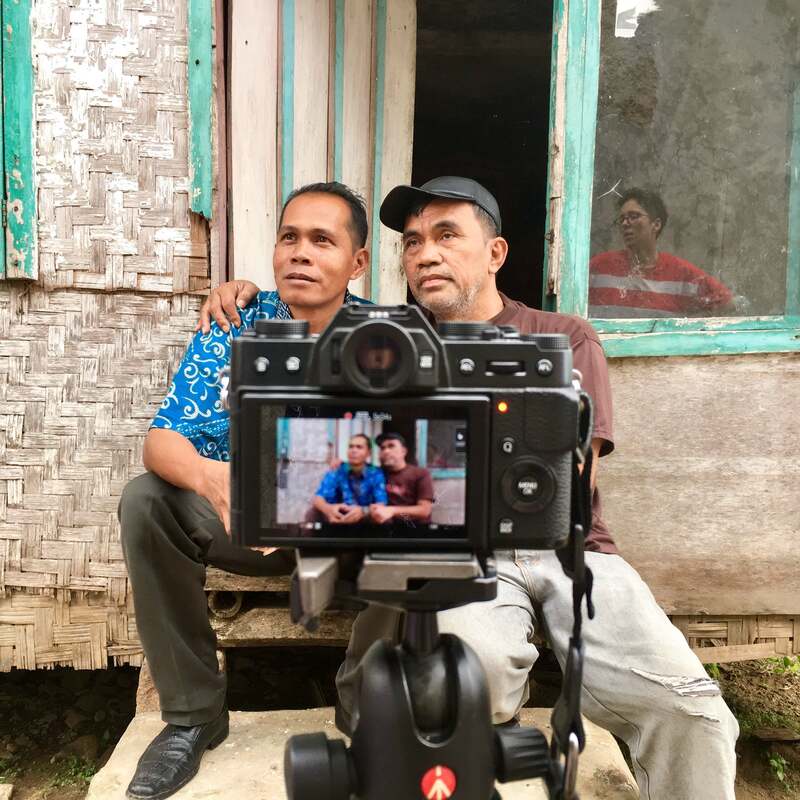 We travelled there with support from British Council Indonesia to visit people who have been held in Pasung (kept in chains due to their mental health) and to learn from KSJ’s radical approach to mental health care, activism, and survival. James and Hana received a British Council UK/ID collaboration grant to support this project and exchange practices. Both Hana and James’ work draws on their lived experience of mental health disability and the surrounding stigma. As artists, they have both worked within mental health institutions and are both active advocates for the Mad Pride movement. Pasung is the act of shackling people in chains, or keeping them in confined isolation due to their mental health. Although it was made illegal in Indonesia in 1977, it is still practised. This type of treatment for mental health is not unique to Indonesia, and is still practiced in many parts of the world. You can read a 2016 report about Pasung from Human Rights Watch here. Both Hana and James had come across KSJ’s work separately, James via a documentary called ‘Breaking the Chains’ by an academic called Dr. Erminia Colucci (please watch with care), which followed the founder of KSJ, Pak Nurhamid, and his rehabilitation work. 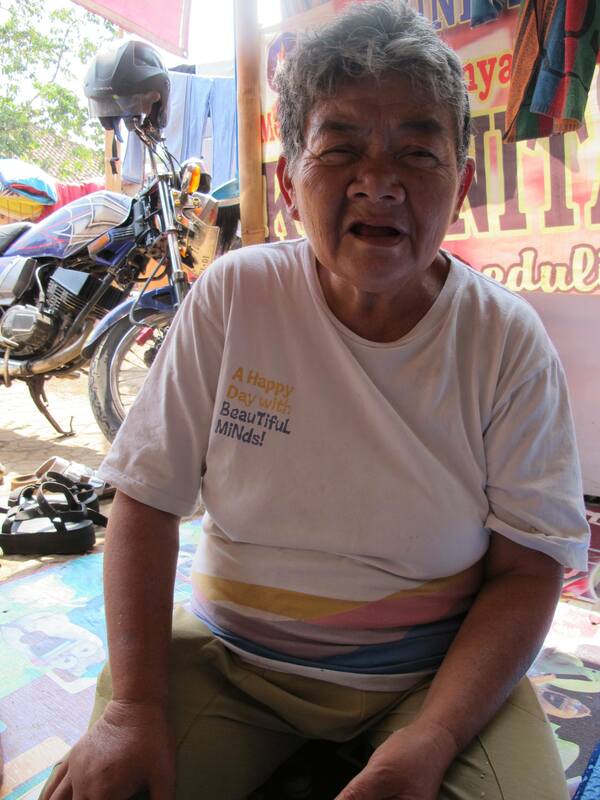 Pak Nurhamid set up KSJ as a refuge where survivors can receive care and safety. He campaigns for and educates on alternative, humane care options and a better understanding of mental health. It is 10 July. Hana, James, our translator Arinta, driver Aidl and I, make the nine-hour drive from Jakarta to Cianjur. Underestimating Java traffic (always add five hours), we arrive at the KSJ Palace late at night. Most of the 44 residents are asleep, but Pak Nurhamid waits up for us. He greets us like we are his children coming home. It is an utter privilege to be welcomed into the KSJ family, and we our immediately moved by their care for us and care for each other. We spend the next three days with the community, hanging out, listening to stories about how the Palace was founded, how people have come to live there and how the community works to empower survivors. We see in practice a radical approach to care built on compassion and a profound belief in equality. James and Hana begin to conduct interviews with the people who live there. We ask if it is ok to document or if we should hide individual faces and identities, and Nurhamid answers that it is important that people are seen as humans, and their stories and faces not hidden or shamed. We meet a resident at KSJ who has taken on the role of cooking the daily meals for the community. We spend time with Nurhamid’s left-hand man, in charge of logistics (delivery and allocation of food, security, etc. ), and learn that he is a survivor of many many years of Pasung. One day we drive to his village, to see the cage where he was kept. When we ask about the system of mutual and non-hierarchical care KSJ has developed – of care-receivers becoming care-givers – Pak Nurhamid explains that he lives by the belief that ‘the best kind of humans are those who are helpful to others’. He believes that helping others, in this case giving back to the sustainability of the KSJ community, is a vital stage of recovery and wellness. One evening, we have the privilege to be invited to join the residents as they take their medication – something that is done as a group, taking turns to pass medication and water between them, with no force or tension. We learn that a volunteer psychiatrist visits the centre regularly, however, not everyone in the community has health insurance and health care is not free, so the medication is gathered through those who have insurance and the resources are then shared. Later, we interview a local midwife who makes regular visits to the Palace as a volunteer to oversee the women’s health. The night before we leave, it is the World Cup semi-final and England is playing Croatia. The game does not start until 1am Java time, but we are invited to watch on the Palace TV. We stay there until 3am. At one point I think I fall asleep, and someone covers me with a blanket. While we are in Indonesia, we also travel to other mental health facilities. 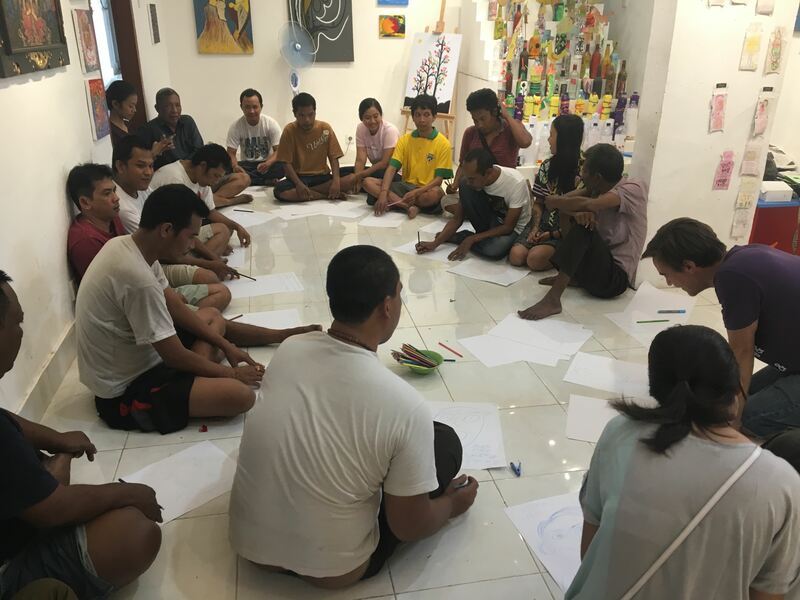 In Bali, James and Hana lead workshops in Rumah Berdaya (House of Empowerment) – a day centre for empowering people with schizophrenia. 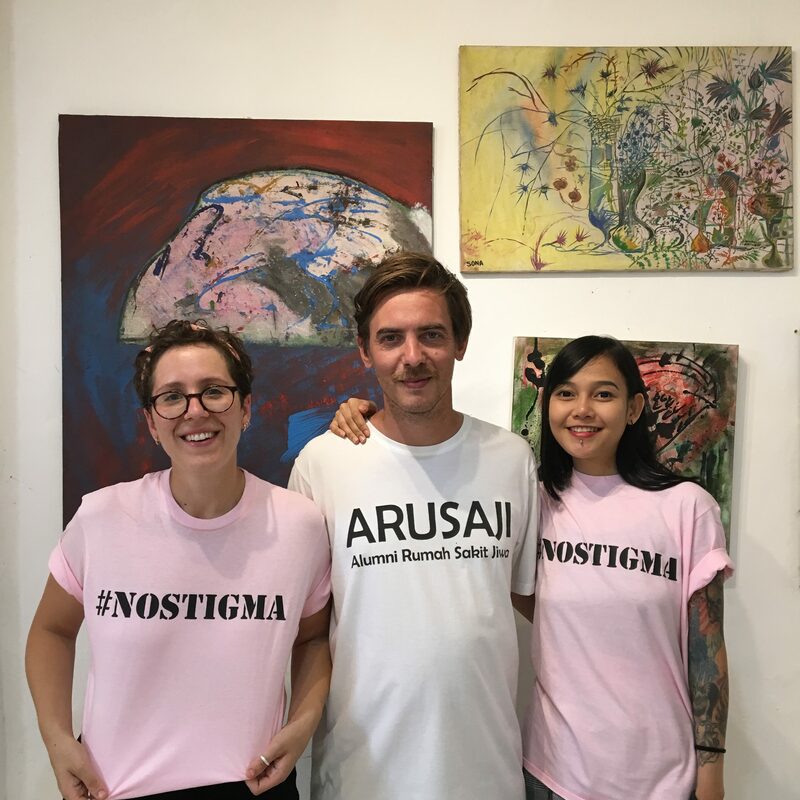 Set up by a psychiatrist and developed in collaboration with an artist, Rumah Berdaya focuses on arts and wellbeing. It has its own art gallery, and a working t-shirt press (see below). Although currently better resourced than KSJ, it once again shows the power of grassroots activism and creative community care. The In Chains film will be exhibited at the National Gallery of Indonesia from 12-23 October as part of Festival Bebas Betas. Taking place at the same time as the Asian Para Games in Jakarta, Festival Bebas Batas will be Indonesia’s first festival of ‘brilliant art by disabled people’. The festival is the brainchild of a collective of artists, curators and activists, including Hana Madness, who was inspired by a visit to the Unlimited Festival in London in 2016. We hope to do the KSJ community Mad Proud.